Laser Resources’ partner Rofin Laser Micro has launched StarWeld Select laser welding system. The StarWeld Select is not merely a manual welding laser nor is it purely a CNC-controlled system, but it is both of these things and even more. The StarWeld Select is the result of decades of Rofin’s experience, an innovator in manual welding lasers, as a result of numerous innovations defines a new laser concept. Are you planning to introduce laser welding? Then the StarWeld Select is an ideal choice. With one universal operating concept, the StarWeld Select can be operated as an ergonomically optimised manual welding laser, as a deposit welding laser with joystick or as a high-precision CNC system. All process steps are controlled through the multi-functional joystick and a large multi-colour touch screen display enabling semi-automatic laser welding, CNC teach-in or jogging of heavy workpieces. The display shows system functions including CNC control and programming clearly laid out in well structured graphics and menus. Especially with manual welding lasers and fully integrated system solutions, the laser enclosure design is critical. The compact housing of the StarWeld Select with its appealing de-sign combines a large number of practical functions. The doors vanish completely in-side when opened, so they are out of the way, a large working chamber, which can be accessed easily, manual ports with leather collars, ample trays and even a specially adapted ergonomic chair. The entire system has a low-noise and low vibration design, which is highly important for intensive working sessions and fine detail welding. The ideally dimensioned axes make the StarWeld Select a robust and, at the same time, high-precision machine. Workpieces weighing up to 50kg and also fine precision workpieces are precisely positioned with an accuracy of 10µm. Joystick technology allows full use of the motorised axis system without CNC programming. The Track-Mode allows direct storage of manually controlled paths and can be used for deposit welding along curved contours or even for semi-automatic operations, e. g. for small batch production. The AreaFill option is an ideal feature, which allows several parallel offset welding seams to be generated for 3D surface deposit welding. SynchroWeld automatically adjusts the weld spot sequence to the axes' travel speed and al-lows consistent seam welds independent of the trajectory. Finally, the professional high-end CNC motion system, which would normally only be available on a much higher priced system, provides the option of welding in linear interpolation mode through 4 axes (xyz plus rotary axis). 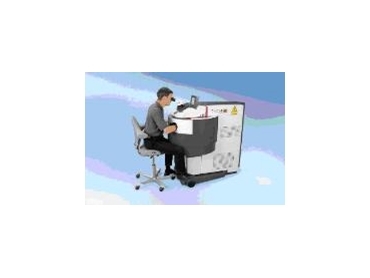 TrueView provides for a 100 % hit rate, even if operation is carried out outside the focal plane, because laser beam and microscope viewing beam path are collinear. EasyTouch converts physical parameters, which are essential for laser control (volt-age, pulse power etc.) into easily understandable graphics with the user-related parameters. Weld spot diameter, strength and hardness - every user can handle the setting of the corresponding welding parameters without prior laser knowledge. With the new Intelligent Pulse Management (IPM), Rofin has satisfied customers' wishes to adjust the pulse power precisely for both fine micro welds and also strong and fast welds. The patented Sweet Spot Resonator provides a consistently good beam quality from the first laser pulse and is the basis for the MicroWeld-Option. This option allows spot diameters smaller than 0.1mm, rather than the commonly achieved minimum spot size of 0.3mm. The speed-controlled exhaust system of the StarWeld Select operates with HEPA filters to remove welding fume in a safe manner. A closed-loop cooling circuit with large filters and cooling surfaces provides for a long lifetime and long maintenance intervals even under full load and continuous operation. The user is able to change consumable parts himself. Each system undergoes a wide endurance and vibration test before shipping, so it is ready for immediate operation without any readjustment on delivery. The StarWeld Select from Rofin closes the gap between classical manual welding and cost-intensive CNC laser welding systems. The innovative concept, packaged in a new and ergonomic enclosure - makes CNC technology profitable even for small batch production: a laser system combining ideal design with high performance.